Toxoplasma gondii (T. gondii) causes the parasitic disease Toxoplasmosis. It is a widespread disease that primarily affects members of the cat family but can be transmitted to humans through infected meat and cat faeces. Most humans infected with T.gondii remain asymptomatic or develop mild flu-like symptoms but severe clinical disease can occur in immunocompromised patients. In addition, T. gondii infection in pregnant women can cause congenital defects in the newborn or may lead to spontaneous abortion. The Native Antigen Company offer high quality reagents for T.gondii research and immunoassay development. Toxoplasma gondii (T. gondii) is an obligate intracellular parasitic protozoan of the phylum Apicomplexa. It is the causative agent of the disease Toxoplasmosis, a common parasitic zoonoses which is widespread throughout most of the world. The domestic cat and other members of the family Felidae are the only definitive hosts for T.gondii. However, T.gondii is also capable of infecting a wide range of birds and mammals, including humans, which act as intermediate hosts. In domestic cats, sexual replication of T.gondii occurs with the release of oocysts, in cat faeces, into the environment. In humans, T.gondii is primarily acquired by ingesting undercooked meat contaminated with bradyzoites (tissue cysts), drinking water contaminated by oocysts, or via accidental ingestion of cat faeces containing oocysts. In pregnant women, infected with T.gondii, vertical transmission of the parasite can occur causing congenital defects or miscarriage. In addition, infection via blood transfusion and organ transplant can also occur in rare cases (CDC). In humans, ingestion of T.gondii tissue cysts or oocysts causes rupture of the cyst wall releasing sporozoites, which invade enterocytes in the small intestine and start to replicate. Infected cells then release tachyzoites which can enter adjacent cells and continue to multiply. This process of cell invasion and intracellular replication can continue allowing tachyzoites to disseminate throughout the body affecting multiple organs. After initial infection, tachyzoites form bradyzoites in human nerve and muscle tissue where T.gondii can remain dormant during the life of the host (Black, MW). Most humans infected with T.gondii remain asymptomatic, or may present with mild flu-like symptoms including fever, headache, muscle pain and lymphadenopathy. However, in immunocompromised individuals, Toxoplasmosis can cause clinical disease including retinochoroiditis, myocarditis and meningoencephalitis, potentially leading to death. In pregnant women, T.gondii infection during the early stages of pregnancy can result in a miscarriage, a stillborn baby or congenital defects of the newborn including visual defects and mental disability (CDC). Diagnosis of T.gondii infection is currently perfomed using serological techniques and indirect immunofluorescence to detect Toxoplasma specific antibodies. Black MW, Boothroyd JC. 2000. Lytic cycle of Toxoplasma gondii. Microbiol Mol Biol Rev. Sep;64(3):607-23. 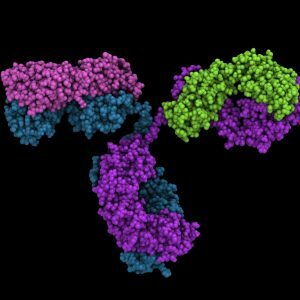 We offer a monoclonal antibody specific to T. gondii, suitable for the development of ELISA and other immunoassays.